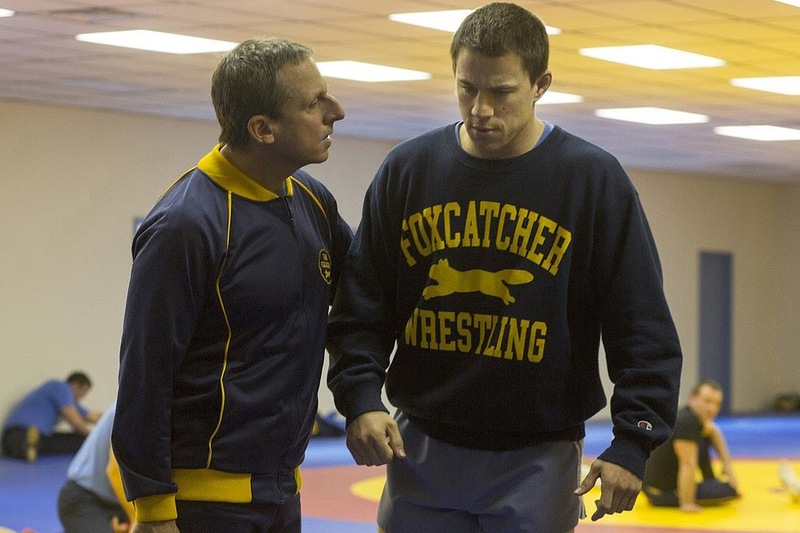 Foxcatcher is a tragedy of ambition. Mark Schultz (Channing Tatum) wants to be the best American wrestler in the world, and John du Pont (Steve Carrell) wants America to be the best country in the world. But these aspirations come at the cost of self-sacrifice and alienation. We're all alone with our stupid symptomatic desires. In this sense, Foxcatcher is not necessarily a Movie About The American Dream—although that never stops it from trying to be. It is a study of characters who believe certain things about America, and at its best it's more about them than about their beliefs. It opens on Schultz, and we feel his loneliness as he stands in for his brother at a motivational speech for elementary school children so that he can buy some crummy fast food. It is more about his alienation than it is about American ideology. The problem is that there are times where it does want to be a Movie About The American Dream. It tries to have its dream and eat it too. 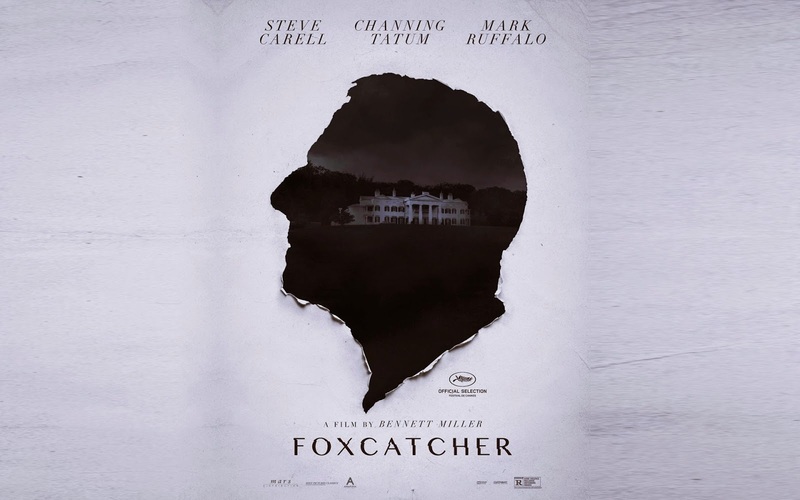 Foxcatcher is also a tragedy of ambition in the sense that the movie itself tries to be a lot and doesn't quite succeed. It tries to be two different movies: on the one hand, Psycho V: The Wrestling Years; on the other There Will Be Wrestling. John du Pont is some combination of the Norman Bates figure, psychologically scarred by his overbearing mother and enacting his repressed sexual frustrations, and the Daniel Plainview figure, embodying an alienating obsession with American ideals that replaces anything in him that might once have been human. But while these are both great characters, and their innately fascinating characteristics make Foxcatcher an engrossing experience, they don't work together in the same person, and they don't work together in the same movie. Instead of being either Psycho or There Will Be Blood, it turns into American Beauty, a well intentioned but messy meditation-turned-bloviation. While its two halves are both essentially character studies, they use their characters for different purposes. One half examines the mind of a psychopath in order to create tension, while the other examines the mind of an entrepreneur in order to extrapolate themes. Foxcatcher falls somewhere in between. At times it is intense, and at times it is poignant, but the two different modes never work toward the same goal. Sometimes Schultz is touching and sometimes du Pont is frightening, but the turns in their character arcs are too contrived for the drama to be truly compelling. Sometimes the screenplay touches on real kernels of American ideology, but the thematic framework is too thin to achieve any genuine insight. What really works in Foxcatcher is ironically not Carrell's du Pont, the ostensible awards-season heavy-hitter, but Tatum's Schultz. The story starts out with him as the protagonist, and gives us real insight into his emotions and his relationship with his brother, particularly in the opening scene with the wrestling warm-up (easily the best scene in the film; it's almost balletic). With how effectively we're put inside Schultz's shoes, it's unclear why du Pont is even dwelt upon. While we see Schultz from inside his head, we always see du Pont from the outside, no matter how long the camera lingers close up on his profile, trying to make him sympathetic. The film attempts to depathologize him, to show that he's just a regular guy list us; but for all its efforts (and despite Carrell's striking performance) it never makes him or his motivations relatable. If it feels like I'm being overly critical of Foxcatcher, that's only because I'm frustrated that it could have been great and hamstrings itself. It tries too hard to be an Important Movie and forgets to just be a movie. Like its characters, it desperately wants to be The Best, but as much as I wanted to be in its corner rooting for it, like its characters it also manages to burn itself out before reaching its peak.